Ceramicist S’bonelo Tau Luthuli’s work Ihubo Lengabadi (Song of the Soil) is presented for a limited exhibition period, opening on First Thursday. Luthuli works in the tradition of the great ceramic artist Nesta Nala and takes inspiration from her, as well as Clive Sithole and Ian Garrett. 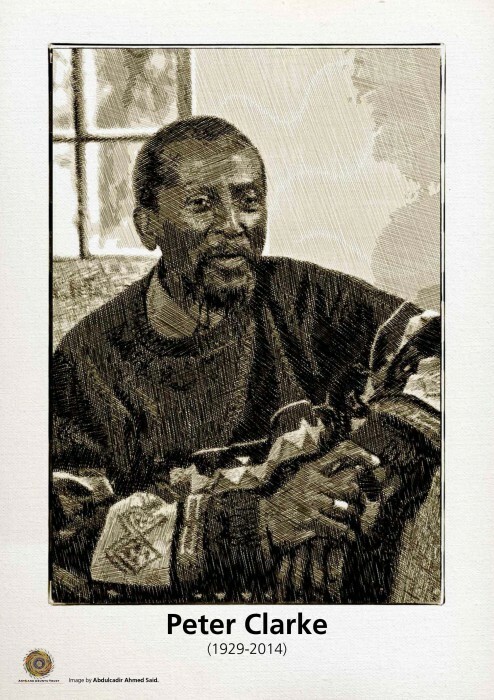 Standing on the shoulders of these great South African artists Luthuli takes pot making to a number of levels – spiritual and meditative, intellectual and philosophical – applying his personal journey as the pivot and pen of his narrative. He skilfully uses every pot he produces to scribe a message, which he hopes reflects meaning in life. Their messages are inspired by African indigenous visual heritage, while demonstrating a progressive contemporary dimension, as well as showing a future with great possibilities. The artist’s statement, an overview, plus detail for every pot, was written in isiZulu by S’bonelo Tau Luthuli and then translated into English by Sokhaya Charles Nkosi – all of which gives access to a rich, painful, but ultimately inspiring worldview and life experience. 6 Spin Street Restaurant is situated in a beautiful Sir Herbert Baker building facing historic Church Square. In addition to its primary restaurant activity, 6 Spin Street frequently functions as an event and gallery space, with solo and group shows. It operated as the Festival Centre for Infecting The City public arts festival for the second year running in March 2014. In 2012 a comprehensive exhibition of the works of Storm Thorgerson was held. The New Black & White Photography exhibition was a popular addition to East City Late (Open Thursday) and October 2014 marked the return of Cape Town Month of Photography (MoP6). Following the recent death of South African artist, Wonga Mancoba, Mike Siluma from the Karibu show on KayaFM 95.9 speaks about the legacy of his father, the avant-garde artist, Ernest Mancoba with Bridget Thompson director of Art and Ubuntu Trust. Artist Wonga Mancoba, has passed away in Paris after a long battle with his health. Wonga in his late 60s, was born to painter, sculptor and thinker Ernest Mancoba and his wife Danish sculptor, Sonja Ferlov, in Paris in the attic of famous Swiss sculptor Giacometti. He would follow in his parents footsteps and become a refined painter whose body of work is inspired by the African paradigm, nuance, and idiom. Wonga, although the son of a South African painter and intellectual, was not able to visit South Africa for the first 50 years of his life. He visited with his father, Ernest, for the first time in 1994. 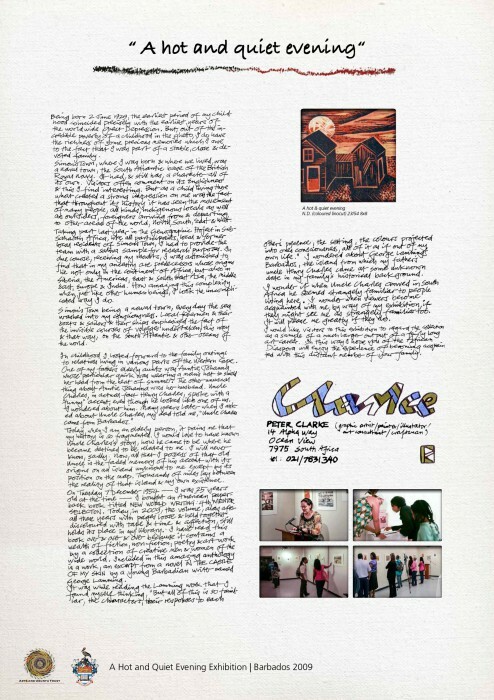 This and subsequent visits had a remarkable impact on his artistic expression. He had already tackled the theme of slavery in black and white but now his themes were visibly anchored on indigenous knowledge and alive with colour. His subject matter, Sophiatown; ‘Ghost’ Areas Act and Taxis was inspired by his trips to the continent before his illness. 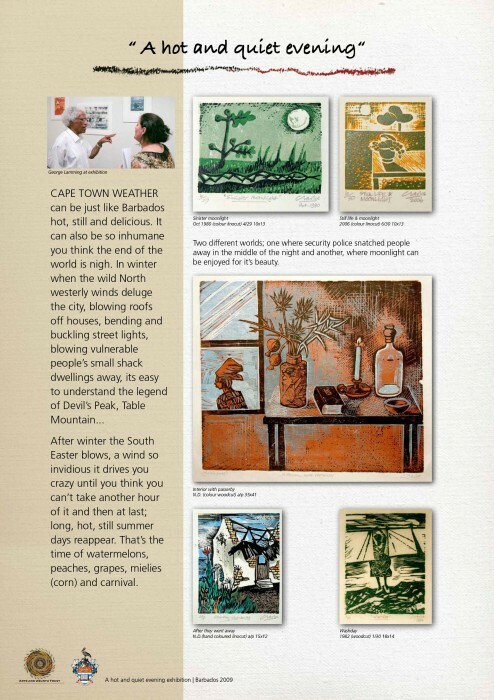 Before leaving South Africa in 1938, Ernest had won significant prizes for his art. He went to Paris to expand his knowledge, there he met a Danish sculptor Sonja Ferlov, married her and she birth to their only child, Wonga. Ernest was interned by the Nazis during the second world war which he survived. The small family tried to come back to South Africa after the war but the Smuts government refused to allow Mancoba to bring his European wife to South Africa. He became stateless and so did she.They eked out a living for a few years in Denmark, and were active in the significant art movement CoBrA but their small son – Wonga – was the subject of racism there. They returned to France where a friend, Ms Penso, lent them a small rural cottage. Ernest often did farm labouring work to help them survive but they both managed to continue to produce remarkable art. In 1961 they were given French citizenship, moved to Paris to a small shop/studio where they continued to produce remarkable art. In 1984 Sonja passed away. Shortly after a South African art historian, Elza Miles, saw a work of Ernest’s on a CoBrA exhibition in Paris and identified the name as South African, traced Mancoba, found him and managed to bring him back to South Africa in 1994 for a retrospective exhibition. It was his first visit in 56 years. He was 90 years old and was accompanied by Wonga. Ernest passed away at the age of 98 in 2002. Wonga was then active in supporting efforts in South Africa to understand his fathers significant artistic and intellectual legacy. Over a year ago, Wonga, now in his 60s, had a series of small strokes and was hospitalized in Paris for many months. He was cared for by long standing friends of the family, Alain Spielmann, Charley Chevalier, Corinne Penso and Elske Miles Elza’s daughter amongst others. Sadly on February 12th he passed away. Wonga was single and had no children. 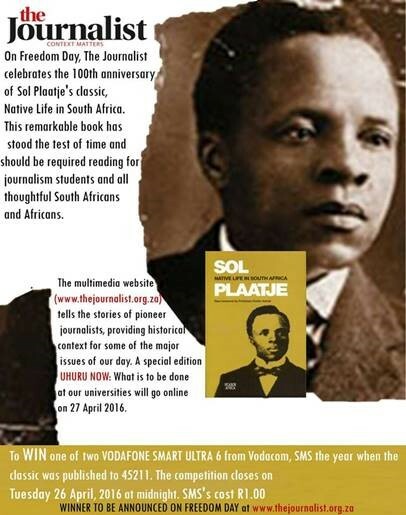 He is survived by his cousins, Zodwa Mkalipe and Ntando Mancoba, who live in Soweto and Matatiele, respectively. http://artsandubuntutrust.org/wp-content/uploads/our-dear-friend-wonga-mancoba-passed-away-in-paris/wonga-small.jpg 700 546 Kate Soal http://artsandubuntutrust.org/wp-content/uploads/logo-padded.png Kate Soal2015-03-03 10:24:042015-08-11 07:32:53Our dear friend, Wonga Mancoba passed away in Paris on 12 February 2015. 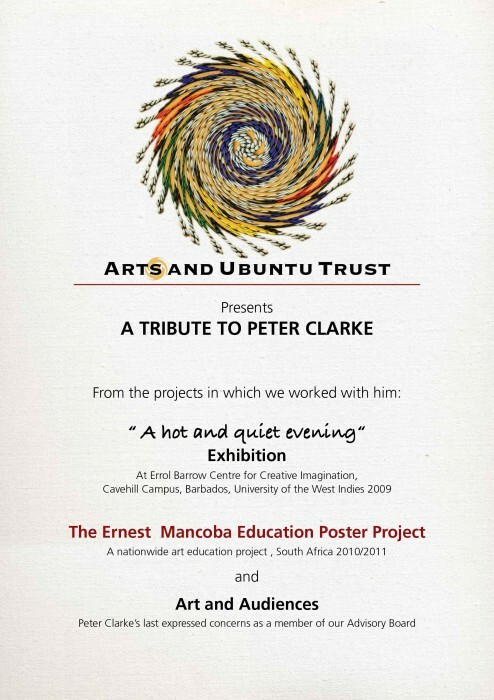 Our dear friend and colleague at the Arts & Ubuntu Trust, Peter Clarke passed away earlier this year. We put together a set of posters for his memorial held at the National Gallery in July as a tribute to a few of the moments in his life that we collaborated with him. http://artsandubuntutrust.org/wp-content/uploads/south-african-arts-past-and-present-project-saappp/activities/IMG_2346_DxO.jpg 687 1000 Kate Soal http://artsandubuntutrust.org/wp-content/uploads/logo-padded.png Kate Soal2014-05-22 11:42:512014-07-25 16:40:21The Arts & Ubuntu Trust return from a successful time in the Northern Cape! 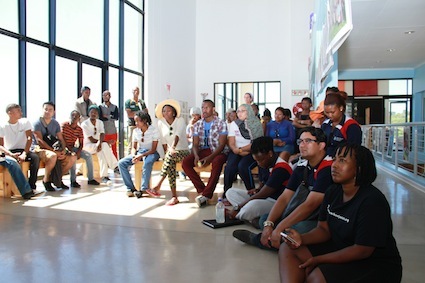 The Arts and Ubuntu trust spent an amazing 5 days at the Emthonjeni Art centre running the training workshop ‘The Creative Journey: From Idea to Screen’ as part of the South African Arts Past and Present Project. They also opened an exhibition of photographs documenting the journey that was the Ernest Mancoba Educational Poster Project which took place nationally in 2010 / 2011. 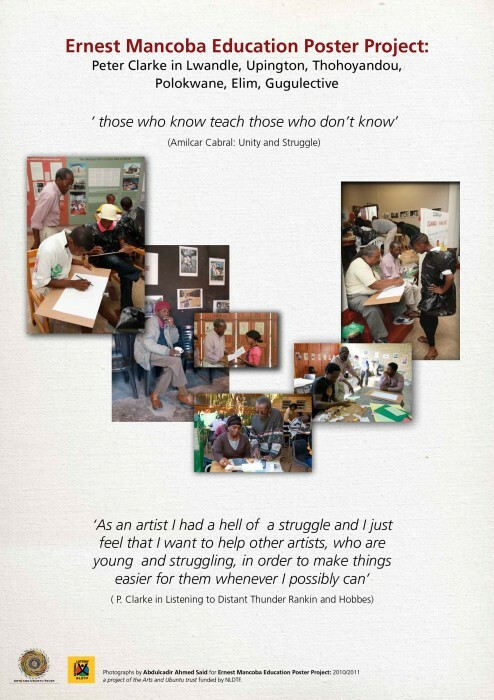 See Emthonjeni’s facebook page for some details as well as our Project section. 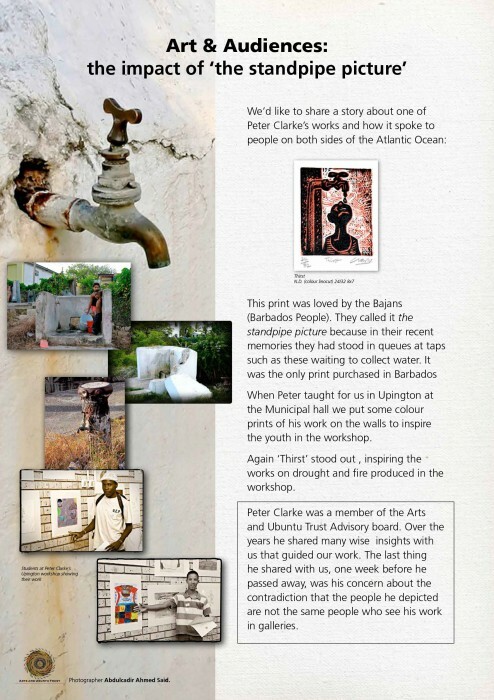 http://artsandubuntutrust.org/wp-content/uploads/example-news-item/Screen-Shot-2014-04-04-at-6.53.06-PM.png 525 792 Kate Soal http://artsandubuntutrust.org/wp-content/uploads/logo-padded.png Kate Soal2014-04-03 06:24:182014-09-03 11:47:49The Arts and Ubuntu Trust and Emthonjeni Arts Center Unite!